The Project Runway Junior finalists are off to create their collections and the BPR party bus is tagging along. We get a 90 minute bonus episode tonight, so settle on in and join the fun. Click on the comment tab to join the party. Hello again Project Runway fans! It's time for our weekly gathering of like minded comedic souls as we watch another episode of Project Runway Junior together. After last week's shocking double elimination. we are down to our final four designers. Will they all move on to Fashion Week? Click on the comment tab to join the party! 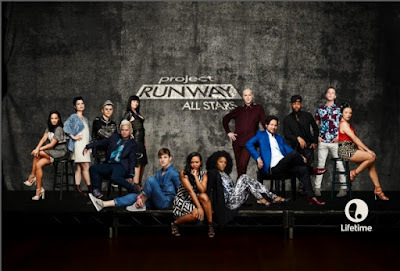 Hi again everyone, it's time for our weekly BPR snark fest as we watch Project Runway Junior Episode 7 together. Show of hands, how many of you old farts know what #OOTD stands for? Thought so. You know the drill - click on the comment tab and come on in. Some of our favorite designers are returning to compete in PRAS5! Alyssa Milano, Isaac Mizrahi and Georgina Chapman will be judging an "anonymous runway" for the very first time and won't know which designer created each garment. Zanna Roberts Rassi returns as the designers’ mentor. Guest judges include musicians Ke$ha, Boy George, Little Big Town and actresses Debra Messing, Vanessa Hudgens, Megan Hilty and Debi Mazar. The designers will also face Project Runway’s Nina Garcia and Zac Posen, supermodel Coco Rocha, celebrity stylist Johnny Wujek, and TV personalities Kristin Cavallari and Brad Goreski. The winner of Project Runway All Stars Season Five will receive the opportunity to design an exclusive line of jewelry for Baublebar.com as well as a capsule collection for Chinese Laundry. The winner also receives a complete sewing studio from Brother Sewing and Embroidery, a fashion spread in Marie Claire magazine and a position as contributing editor for a year. In addition, the winner receives a $100,000 grand prize to elevate his or her business and brand. Happy everything Project Runway fans! We are back after a two week holiday hiatus and ready to kick things into high gear. Tonight the Knicks City Dancers get a desperately needed uniform makeover. The BPR party crew is ready to watch along with you. Click the comment tab to join the party! It's nice to see the franchise acknowledge the existence of UTG. Fun fact: Daniel Franco joins Katelyn Pankoke as the only designer ever to make three appearances on Project Runway. Click here for the story.